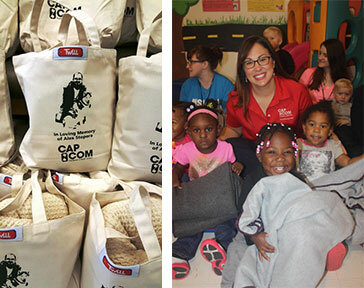 “CAP COM partnered with Twill to provide totes and blankets to all 350 of our staff members. Through the Blanket Buddy Program, an additional 350 blankets were donated to seven organizations in the Capital Region. From the start, Twill Co-Founders Zac and Jer were easy to relate to and talk to. There was an immediate sense of comfort and relief that an organization such as Twill was created to show people that someone cares for them. Together, in partnership with Twill, we delivered hundreds of smiles while paying it forward in loving memory of Alex,” said Amanda Goyer, CAP COM Cares Foundation Administrator. Together, CAP COM and Twill will donate and deliver 350 blankets to the following organizations in our region: Mental Health Association, Cohoes Community Center, Unity House, Joseph’s House, St. Paul’s Center, Northern Rivers and Vanderheyden. "We are so thrilled to be partnered with such a community-minded business like CAP COM. They truly care about the community in which they do business, they care about their employees and they've helped lift the spirits of our small startup company,” said Zachary Halloran Twill’s CEO & Founder. Photographed above: On the left, Twill bags designed in loving memory of past CAP COM employee and family member Alex Stopera. On the right, Amanda Goyer, Foundation Administrator during a blanket delivery at Northern Rivers childcare center in Schenectady. CAP COM Federal Credit Union is a member-owned financial institution based in the New York’s Capital Region with $1.3 billion in assets and 10 branch locations. The credit union is member-driven and focused on superior service, convenient products and competitive rates that help members save money and make life just a little easier. CAP COM offers all the products and services you’d find at a typical financial institution. Visit www.capcomfcu.org to find out more. Federally insured by the National Credit Union Administration. Equal Housing Lender.